Expect a different level of plumbing experience with a qualified plumber in Placentia, CA. Our personnel comes fully prepared with everything that may be needed for the repair or installation job, including spare parts, so no time is wasted to get things done. Our skilled plumbers at OC Plumbing Pros will not disappoint you. Our Placentia plumber will respond immediately to your call for plumbing repair or periodic maintenance. Our service vehicles are equipped with all the necessary plumbing tools, plus replacement parts, so our personnel can perform the required service right there and then. Do not wait until the last minute, or when the problem has already spiraled out of control, in the effort to save money. Call us 24/7 at (949) 371-8413. Affordable Installation and Repair of Water Heaters From Plumbing Company: When any part of the plumbing system breaks down, homeowners can only groan in exasperation. That’s because repairs cost money. Having us over also allows us to check if you are using your heater to its full capacity, or beyond its capacity. Nevertheless, before you start shopping for a new unit, have our team over to check if repairs can still be done or if purchasing a unit is imminent. Sometimes, all it takes is just a simple repair job. Drain Cleaning Services To Keep Drains Open: Particulates and fibers that have accumulated over the years can clog your drain. The effects of a clogged drain can be annoying and unhygienic. Our wire cameras can follow through the drain and find out exactly where the problem is. We do advice that you call us to check your drain before any such problem occurs. Detecting and Repairing Water Leaks: If you cannot locate the leak yourself in your Placentia, California property, especially in the case of slab leaks, which are difficult to spot without the proper tools, have our qualified team over to check it out and repair it. Homeowners, however, should suspect something when there’s sudden spike in their monthly water bill when the amount of consumption remains the same. We’ve had cases when homeowners came back from a vacation to find their house in wreck because of an unattended water leak. In less extreme cases, a leak can cause a sudden surge in your monthly bill. Water leaks are more than an annoyance; they can seriously damage your floors, walls and ceilings, not to mention your furniture or appliances. This is why it is important to detect leaks right away, and fix them too. Emergency Plumber Placentia – Call Us Now! 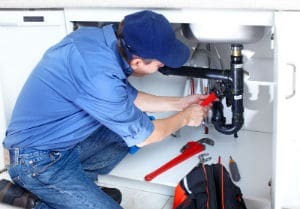 We Provide Re-piping, Garbage Disposal Repair and Installation Services: If you have a damaged water pipe in your property or if there is a need to relocate your pipes in order to conform to the new property plan, keep us in mind to perform what is required in compliance with safety codes. Our licensed plumber can also fix your leaking garbage disposal, or set up a new unit in your home. Never, ever try to do this on your own. It’s a complex system of gravity, water pressure and flow. Let us emphasize that repairing or installing garbage disposal is something you must leave under the hands of an expert, because there are specialized tools and skills needed to get the job done flawlessly. We also take care of the permits and licenses required under the building code. Worry Not About Toilet Installations and Repairs: A broken toilet can be a health-hazard, too. Have our plumbers over to see what the problem is and recommend for replacement, if necessary, especially in the case of broken toilets. We have the tools and know how to fix a broken toilet without you having to hole up in some hotel for days. One of the worst things that can happen in the home, workplace, or any establishment, for that matter, is when a toilet breaks down. We want to be able to help you when that happens. Round The Clock Emergency Services By OC Plumbing Pros: Here at OC Plumbing Pros, we offer round the clock services because we know we cannot put off a plumbing emergency when it happens at midnight or early in the morning. Feel free to call us, then, when you notice something is not right with your plumbing system. We can send a team to your house or office right away. Call Our Plumbers Now! Our plumbing contractors are continuously trained to keep up with the demands of the time, and they can share with you whatever knowledge they have regarding plumbing maintenance. We guarantee an experience like no other when you connect with our Placentia plumbers today. We require excellence in all our undertakings, including our customer service. In this case, we can rightly claim that OC Plumbing Pros is synonymous to quality and competitive pricing. Call us today at (949) 371-8413!